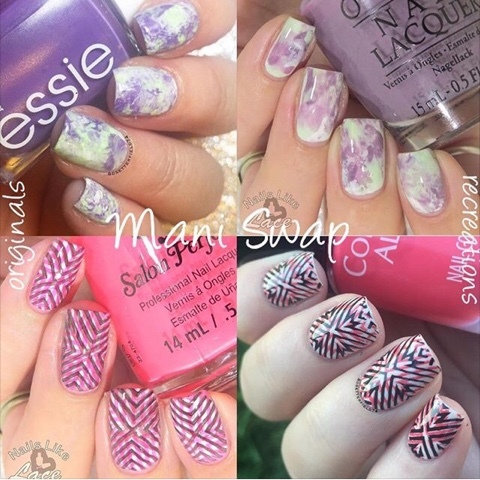 It is Sunday again, and so another Mani Swap Sunday is in order! 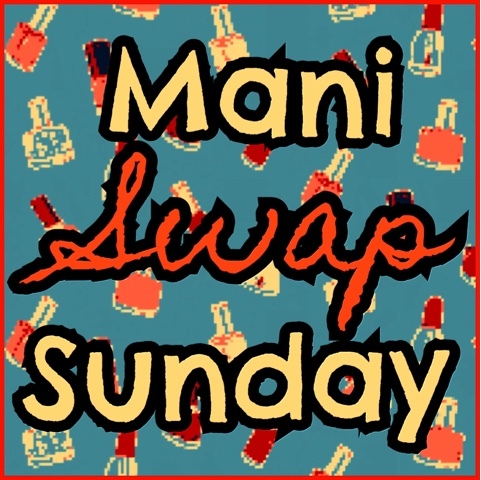 Originally I was doing Mani Swap Sunday once a month with April, but recently posted a little announcement on Instagram inviting anyone interested to join me in a mani swap to make it a weekly tradition instead! This time around I teamed up with @dsetterfield74. I had some technical difficulties and ended up going quick and easy by recreating her green, white, and purple squishy mani. I've done plastic wrap marbles and various types of dry marbles, but this was my first try at a stamper marble. I dotted each of my three colors (Sally Hansen Mint Sorbet, OPI Hello Hawaii Ya?, and Poparrazi Icing on the Cake) randomly in one small area of my silicone mat, then smashed into it with my Creative Shop stamper and transferred that to my nail as you would a stamped image. It is definitely a softer marble than Saran wrap marbles or needle drags, and I really love how it turned out. More authentic marblesque I think. I love it! In turn, Dianna recreated my triple stamped criss cross stripes design I did earlier this month, and her version looks so cool! Of course thanks to Dianna for mani swaping with me, they're always so much fun to do! Don't forget to check her out on IG too! And of course thanks for stopping by! Shoot me an email if you're interested in doing a Mani Swap Sunday with me, too! Skill level isn't important, I'm okay with doing more beginner-level looks, as long as you take clear, well-lit pics; I'd love to do swaps with more of my fellow polish friends!